The Hotel Stendhal is located in the city centre of Rome only a few minutes walk from the fashionable shopping boulevard of Via dei Condotti. The Condotti is Rome's most exclusive shopping precint and is famous for the Made in Italy label as only designer labels like Gucci, Versace, Prada and Dolce Gabbana can be bought here. The Air Terminal for Fiumicino International Airport (also known as Leonardo da Vinci Airport) is located inside Termini Rail Station which is only 1.5 km away.. To arrive from Ciampino Airport (Rome's second airport and where Go and Ryanair flights arrive) we suggest the EasyJet courtesy bus which leaves guests at Termini Railway Station. Alternatively a taxi from either airport will cost approximately 45 Euro. Once you reach the Grande Raccordo Anulare which is the ring road around Rome you should take the exit Rome's Ring Road the GRA - Grande Raccordo Anulare take the exit for Via Salaria and follow the signs for "Centro" i.e. the city centre of Rome The Hotel Stendhal offers its guest's a parking facility in a nearby garage and for this service a supplement will be charged. Please let us know if you will be arriving by car so we can organise accordingly. Rome's main railway station Termini is near the Hotel Stendhal Rome distance Hotel Stendhal to Railway Station is 1.5 km. The Airport shuttle train stops at Termini Railway Station. You should take line A from Termini Underground / Metro in the direction of Battistini and alight 2 stops later at Barberini Metro Stop. The Hotel Stendhal is towards the top of Via del Tritone just after Piazza Barberini. 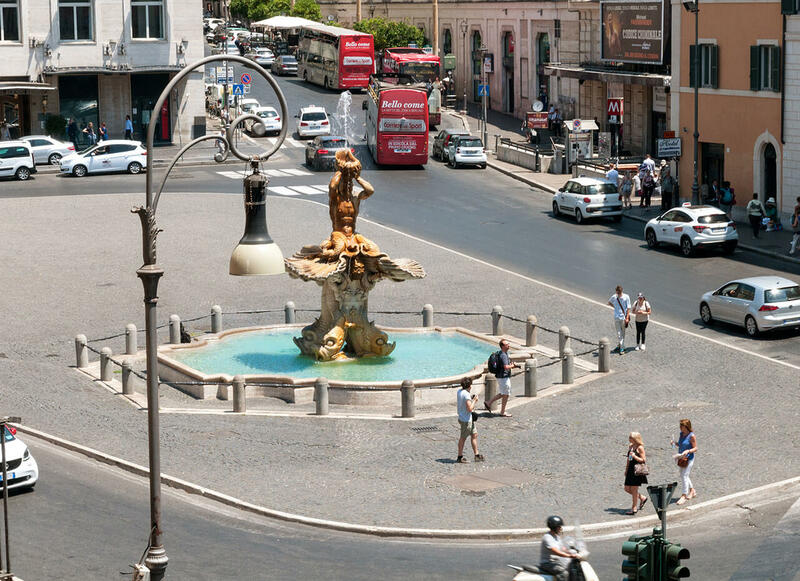 50 metres from Barberini Metro Stop Line A on Via Veneto - Hotel Stendhal is very near the Metro or Subway service making access to further more remote parts of the city extremely easy. 100 metres from the National Gallery of Ancient Art which houses some of the most important works by artists such as Bernini, Borromini, Rubens and Caravaggio. 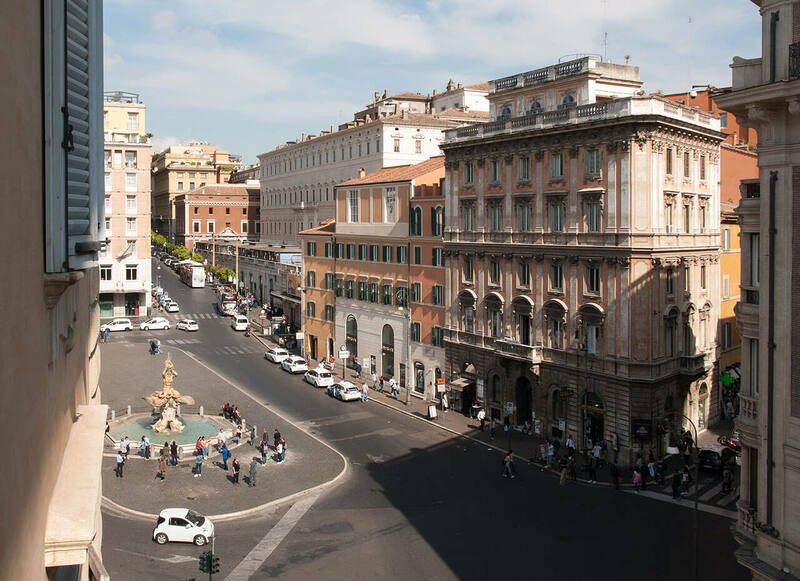 200 metres from Piazza di Spagna or Spanish Steps and shopping at the world famous Via dei Condotti. 300 metres from the famous Fontana di Trevi or Trevi Fountain a must see for every visitor to Rome. 400 metres from the famous Villa Borghese which is one of the largest public parks in Rome. Ideal for an early morning jog the Villa Borghese is a must see for anyone who appreciates the great outdoors. 1.5 Km from Termini Railway Station The city of Rome's most important railway station and where all the international and national eurostar and intercity services stop - the airport shuttle train terminal for Fiumicino (also known as Leonardo da Vinci) international airport is also here. 1.5 Km from the Pantheon - the only intact piece of Roman Architecture still standing. 1.5 Km from the Colosseum the symbol of ancient Rome and the historical city centre. 2 Km from St Peter's Church and the Vatican Museums - buses from the city centre to the Vatican city are very frequent and travel time is less than 20 minutes.